Will help to determine if you are a good fit for the study (see inclusion and exclusion criteria below). We will compensate the participant $30.00 for the initial 1.5-hour total interview (regardless of if you are found to be a good fit for our study or not). You will be invited to participate in an 3-month randomized controlled trial followed with longitudinal follow-up study. Before the Trial begins, we will invite you to participate in the Pre-Exercise Assessment (5 hours total, compensation = $150). This will involve a diagnostic and real-world functioning interview (1.5 hours), cognitive testing (2 hours), structural brain scan (1 hour), and fitness evaluation (which we will use to devise your personalized fitness prescription; 30 minutes). 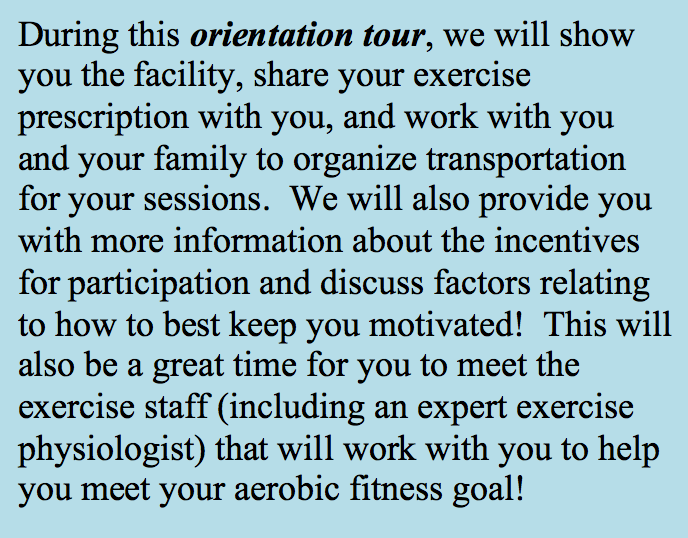 Note: at this stage participants will either be randomized to an exercise trial, or a waitlisted condition. Those in the exercise trial will proceed to step 3. Those in the waitlisted condition will proceed to step 5. Those individuals who are assigned to the waitlist and still wish to exercise after the 3 month period (after completing step 5) will be welcome to do so. This will involve the same supervised tailored exercise regimen in our lab over 12 weeks that the exercise group received (we do not want anyone to feel left out). While time spent exercising for these individuals will not be compensated, they will still receive the expert attention (and there will be no cost). A) 2 times a week (1/2 hour each session) for 12-weeks at the intensity of 80% of your personal cardiovascular output (high-moderate intensity). Participants will be compensated $15 each session (a total of $360 for the entire 3 months or 24 sessions). You (both exercise and wait-listed groups) will be invited to complete the Post-Exercise Assessment (5 hours total, compensation = $150). Identical to the Pre-Exercise Assessment, this will involve a diagnostic and real-world functioning interview (1.5 hours), cognitive testing (2 hours), structural brain scan (1 hour), and fitness evaluation (which we will use to devise your personalized fitness prescription; 30 minutes). This will allow for us to determine what types of changes you experiences as a result of the exercise you have just completed over the past several months. Those individuals in the wait-list group who wish to exercise can begin the trial at this stage. They will receive the same expert supervision and tailored training that the exercise group received. While these sessions will not be compensated (you will not be paid for your time if you elect to do the exercise at this point), these services will be provided for free. You (both exercise and wait-listed groups) will be invited back in for a check-up interview (3 hours total, compensation =$90 at each of the two annual assessments). During these follow-ups, we will administer the same clinical and real-world functioning inventories that you were given at the Pre and Post Exercise Assessments. Referrals to ADAPT can be made by family physicians, pediatricians, psychiatrists, and mental health professionals. If you have a client you think might be appropriate for ADAPT, you are welcome to call us for a consultation at (847) 467-5907. You may also give a brochure to the client or family and have them contact us directly. Individuals interested in help for themselves or someone they know may also contact us directly. Please note: these criteria are different than what is noted for participating in the broader ADAPT studies and Chicago Early Intervention Studies. If you are not able to participate in this study because of age, medication, or counter-indications for the neuroimaging, it is very likely that you will still be able to participate in other studies. Please contact our staff for questions about participating.